There is a small but dedicated group of Vermonters and cow lovers dedicated to the future of Randall Linebacks – a breed of cattle unique to Vermont. This organization is currently trying to get the Randall Lineback designated as the official Vermont State Heritage Breed. The Randall Lineback is a rare breed of cow that is defined by the distinctive lineback color pattern. The Randall family of Sunderland, Vermont developed their herd for dairy and farm work but they have become a multi-purpose breed. 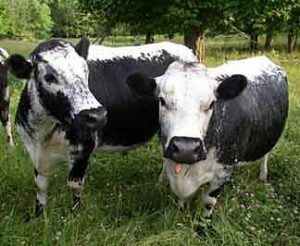 Unfortunately they are listed as “critically rare” by the American Livestock Breeds Conservancy.Ask us about Vermont Cows or share comments. To feature your Vermont business, contact us. The Randall Lineback is a rare breed of cow that is defined by the distinctive lineback color pattern. The Randall family of Sunderland, Vermont developed their herd for dairy and farm work but they have become a multi-purpose breed. Unfortunately they are listed as “critically rare” by the American Livestock Breeds Conservancy. This distinctive breed has developed their own instincts and traits. Randalls forage well on pasture, are naturally resistant to parasites and possess remarkable survival instincts. The Randall Lineback breed originated in New England – a mix of European breeds that were brought to Vermont and neighboring states in the 18th and 19th centuries. The breed is named after the Randall family of Sunderland, which is located in southwestern Vermont. In the mid 1980s the breed was faced with an uncertain future when Everett Randall passed. Fortunately some small groups of Randalls were sold to individuals who were interested in preserving the breed which has been brought back from near extinction to around 150 animals. Randall Linebacks are still listed as critically rare by the ALBC (American Livestock Breeds Conservancy. For more information or to get involved in helping to preserve this piece of Vermont history contact the SVF Foundation, 51 Beacon Hill Road, Newport, RI 02840 or call 1-401-848-7229. A list of Randall Lineback breeders and more information may be found at www.randall-lineback.org. For more information about Vermont Cows and more Photographs of Vermont Cows, visit our Cow Section. – special thanks to David Randall for providing information and photographs used in this article.